The early part of December 2018 has been eagerly awaited with the excitement surrounding the inaugural Alchemist Cup increasing the closer December 5 came. A grueling format facing 50 of the best players from around the world (and more than a few close by in the Penang International) with plenty tuning in from across the globe via Twitch. In an extended version of our usual "Five Moments" series, we present some of the highlights from what was a thrilling five days in Penang. 1. Thank you Michael Tang! 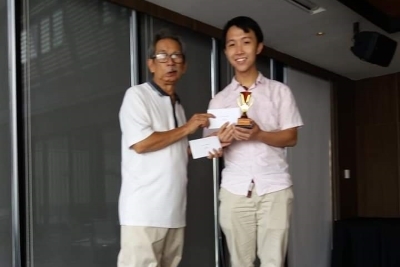 We have the tireless work of Michael Tang (pictured) to thank for what has been recognized in so many quarters as the ne plus ultra of Scrabble events. The amount of work put in cannot be overestimated: many hours of promotion and attendance at international events along with a tournament formula that guaranteed the attendance of 50 of the World's best players. Even during the event, Michael was ensuring those who could not make it were kept informed with multiple posts on high profile Scrabble groups within social media. This event captured the Scrabble community's imagination - with analysis continued beyond its conclusion, both in social media groups and on live Scrabble shows such as the unmissable NASPA Tonight. 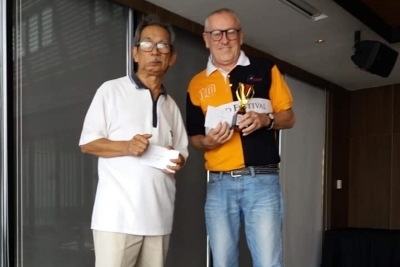 In the early days after the event, Michael Tang was appointed the Tournament Director for the 2019 WESPA Championship to be held in Goa during October, and we cannot wait! A fitting accolade for one of the true ambassadors of the global Scrabble community. As with many things, there is a team that also deserves recognition and our thanks; they, too, were there for the 45 games and without their efforts, so many of this would not have been picked up. The Alchemist Cup website listed the team as Barry Harridge (for website coverage), Kumar Elijah for his broadcast work and two people whom many of us watching on would have been following intently. Jesse Matthews and Jason Katz-Brown in commentary. They have our immense gratitude for an amazing event. To play 45 games of Scrabble over 5 days where all your opponents were of the highest calibre certainly requires intensity and dedication. So, too, would commentating these games! 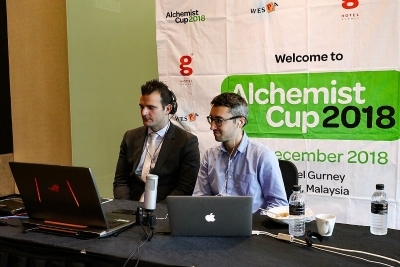 The live stream not only provided us with a window into what the players were doing but all eyes could easily turn to the bottom left of the stream, where Jesse and Jason were included against a backdrop of the Alchemist Cup banner. They, too, had to be "on" just as much as the players. Without a doubt, they also delivered! Jesse is no stranger to commentary (having commentated at a NASC as well as the 2016 Causeway Challenge - with Chris May) but many would not have heard Jason in commentary. Delivering in their own styles enhanced the stream at all times - from the discussions between moves or post game analysis, their contributions demonstrated why Scrabble streaming needs good, live commentary to complement the feed. Their reactions to plays on stream like PUNJIING (Chollapat), TUCKAHOE (Theresa Brousson), SMORZATO (Theresa again), DELAMINATE (Dave Wiegand) or the delightful DULCINEAS (Adam Logan) reflected the moods of the stream. Indeed their interaction with the comments in the stream was an asset to the coverage. If you can get the chance to view the coverage, do yourself a favor and take a look. You will not be disappointed! One of the sheer beauties of a live stream which continued between games would be the impromptu guests who would pop into the commentary area. Evans Clinchy, Chris May, Will Anderson amongst others made the occasional wander into the stream, making the easy transition from player to guest in the blink of an eye. New Zealand's Howard Warner provided one of the more fascinating insights when he related a story concerning one of his team members; Nigel Richards. It concerned an early tournament foray of Nigel's, where he cycled from Christchurch to the venue (Dunedin - some 360 kms away, taking in amazing scenery), played his games and then cycled back immediately after! 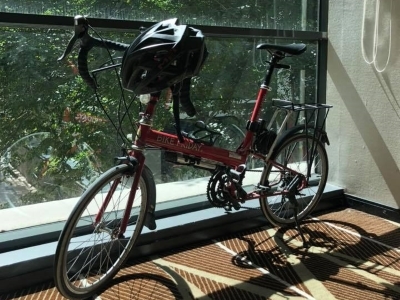 This anecdote certainly captured the imagination of many, and, soon into the subsequent day, a photo of Nigel's bicycle (seen here) made its way onto social media. Nigel would make at least one venture toward the commentary area during the event, though not on camera. It did not stop Jason from attempting an interview - it was extremely brief. Michael Tang had observed, prior to Alchemist Cup, that Australia were one of the favorites going into the event; this was a view not shared by many others according to a poll in WESPA's Facebook Group, which placed Nigeria as a strong favorite ahead of the US and the Rest of the World further back in third. Somehow it meant that a team where every player had been national Champion (with one of them the current title holder) and had a WSC runner-up and World Champion in their team entered a team event where many (except, of course diehard Aussies) did not think they would win. 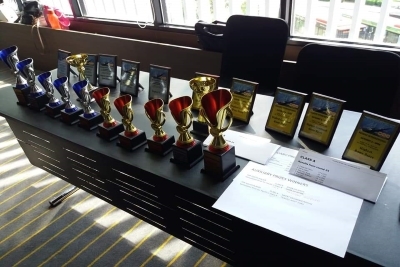 In structuring the event in the way that it was, the intent was to determine the overall team winner as late as possible, ideally into the last round. True to form, this was the case, as Chris Hawkins reported to Facebook "One by one they slowly appeared. 2-0 to USA, 3-0 to USA. 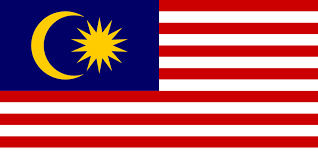 Wait 4-0 to USA! The Australia results started to appear more slowly with only one being there for the longest time, a win for ROW, then three more appeared 2-0 ROW, 3-0 ROW. Wait! 4-0 ROW!!! So, both matches were now decided, ROW had beaten Australia and USA had beaten Nigeria. But surely the 5-0 whitewashes that the USA desperately needed and Australia dreaded weren't going to come to pass were they?" 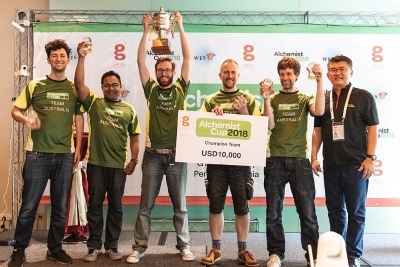 The final two matches in the respective rounds went favorably for the Aussies and led to #TeamAustralia emerging victorious by near to closest of margins, making them the inaugural winners of The Alchemist Cup. Could it also mean that more will consider them favorites for 2020? 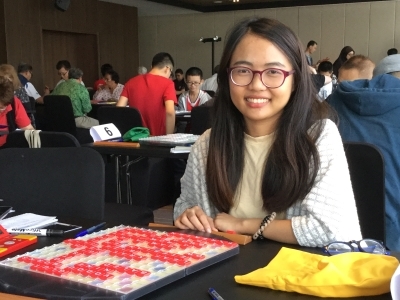 "Sitting down for my first game in Penang International (side event to Alchemist Cup) I was a little shocked to lose my first game, against a young lady i recognised as a past World Youth Scrabble Championship contestant. I then watched her work her way up through the field, to finish the first day in top position. It warms my heart to see young players stick with our wonderful game, after debuting in World Youth Scrabble Championships/ WESPA Youth Cup events. Here is a little more information about Natchaya Sritharo, from Thailand." 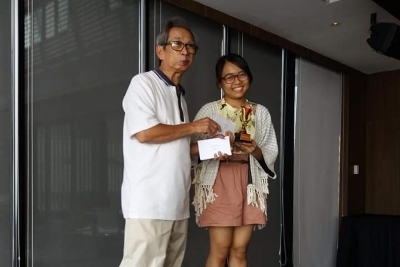 "When I am stressed from studying (Medicine), Scrabble is a way for me to relax"
Whilst many people were devoting their time to following every available minute of The Alchemist Cup, the Penang International ran along side for the final three days. 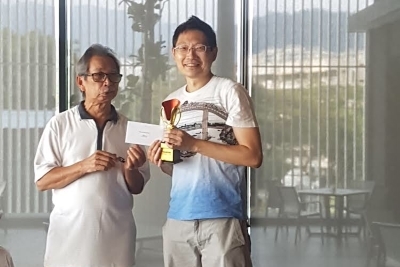 It was a keenly fought 24 game affair with many players eager to be a part of an exciting time in World Scrabble and, at the conclusion, the winner was Singapore's Cheah Siu Hean (pictured here). 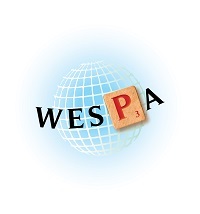 The WESPA Secretary's international Scrabble history goes back 20 years and has seen him win the Australian Championship twice on his travels. Indeed Cheah has been a regular at Australian events as well as playing events on three continents. This win was his first since taking out an event in the Philippines almost EIGHT years to the day. He is pictured here with MSA's Mohammad Ali Ismail. Below we feature photos of some of the other prize winners and the trophies on offer; just rewards for three days of top quality Scrabble. Photos used provided by Kumar Elijah, Mohammad Ali Ismail with some originally appearing on Facebook.